Acure Organics Company Review 2018: Acure To Your Skin Woes? Home | Reviews | Acure Organics Company Review 2019: Acure To Your Skin Woes? Acure Organics Company Review 2019: Acure To Your Skin Woes? Is Acure Organics Cruelty Free? Is Acure Organics Vegan? 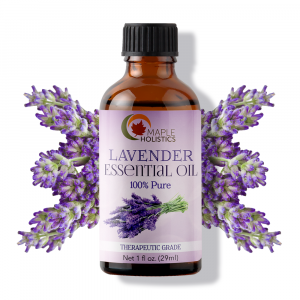 If you’re here at Maple Holistics, then you probably love all things natural, and care about the products that you use on your skin and hair. Well, so does Acure Organics. That’s why we have reviewed this absolutely organic and incredibly budget-friendly cosmetics company. If you haven’t yet heard about them, keep on reading. You may just be doing your skin, body, hair and health (and wallet) a huge favor. It’s sad how Acure Organics began, but it’s also happy. It’s sad because the owner of Acure Organics, Kristy Guerra, was driven to start the company after her grandmother suffered from breast cancer for 10 years. But it’s also happy, because as a result, Kristy is devoted to raising money for breast cancer research, and all Acure Organics’ products are made without any harmful additives or chemicals that are linked to cancer. In short, Kristy’s view was of a company that produces safe cosmetic products that we can enjoy without worry – not from a health aspect, nor from a financial aspect. If you have oily and/or acne prone skin, you need to try this product – seriously. If you’re into organic products – even better. Acure Organics’ Marula Oil can be used on your skin or in your hair. 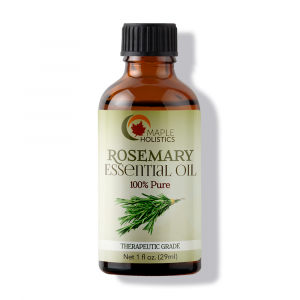 It’s much lighter and less greasy than other oils you might find. If you’ve been trying coconut or olive oil without success, you may want to try Marula Oil. And while Acure Organics is certainly not the only company that produces 100% marula oil, it’s incredibly cheap for the product that it is – only $15.99 USD for a one-ounce bottle! If you can’t appreciate what that means, there are other brands out there selling the same size bottle with the same product for $72 USD. Marula oil is full of antioxidants and essential fatty acids, which clears blemishes and helps give your skin a healthy glow. You only need a couple of drops; it goes on super easily and absorbs into your skin without making it feel oily. For your hair, take a drop or two of the oil, warm it between your fingers, and then run your fingers through your hair (focusing on tips if you have split ends). You’ll instantly notice a healthy shine to your hair. There’s a 99.9% chance you have heard all about Argan Oil before. I’m hardly the first one informing you about its benefits. Like marula oil, argan oil can benefit both your skin and your hair. If you’re looking for an oil with anti-ageing antioxidants, this is it. Argan oil is loaded with Vitamin E, and is great for cell growth (important for both hair and skin). I have extremely frizzy hair, and nothing calms it down like Argan oil. Literally the second after it’s applied, my hair lies flat with a beautiful, healthy shine and no frizz. Because it is a heavier oil, it may not be the best thing for those of you with acne-prone or compromised skin (such as rosacea). When applying to your hair, take a small amount, warm between your fingers, and run them through your hair. Take care to avoid the scalp area, or target your ends first and then use the leftover amount for your scalp – you don’t want your scalp to get oily. You can purchase Acure Organics Moroccan Argan Oil on their website or on Amazon, for under fifteen dollars (including shipping). If you’re a real Argan Oil lover, check out our Maple Holistics Argan Oil Shampoo and Conditioner, which work to rejuvenate limp hair and are safe for coloured hair. Your hair will be soft and smooth, and – added bonus – smell fresh and divine. I don’t know about you, but I love grainy scrubs. The texture is so soothing, and somehow feels more authentic. Acure Organics’ Brightening Facial Scrub is about as authentic as it gets, being that its ingredients are completely natural and organic. And yes, this is a grainy scrub! 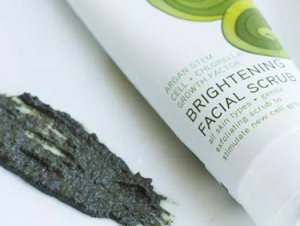 According to the Acure Organics website, you should apply this exfoliator to your wet face and scrub gently to remove dead skin, bacteria and other impurities before thoroughly rinsing. A little goes a long way with this product; you don’t want your face to look raw. Because of the natural ingredients, this scrub works well for most skin types. However, if you have super-sensitive skin, you might want to try this on a small area first to see how your skin reacts to it. Otherwise, this is a great product that brightens and clears the skin, and is the perfect addition to your skincare collection. Considering the quality and the fact that this product will last you a long time, $9.99 is an incredible price. In fact, most organic products are known to be expensive, so it’s quite amazing that Acure is able to bring their prices so low. You may have heard that shampooing too often can strip your hair of its natural oils, and you should therefore be shampooing twice or three times a week. This is true. But if you’re one of those oily hair gals, you’re probably just imagining all that oil build-up if you didn’t shampoo your hair every night. That’s where dry shampoo comes in. It absorbs the oil in your hair between washes so that you look like a human again, but isn’t as harsh on your hair as regular shampooing might be. Plus, its way quicker to use, and you don’t have to restyle your hair after using. I actually can’t find Dry Shampoo on the Acure Organics site for some reason, but you can purchase it from Amazon. 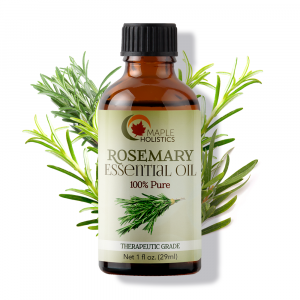 Woke up this morning with an oil bath for a scalp, but no time to shower and style your hair? No problem. Just sprinkle a little of Acure’s dry shampoo (really – a little. You don’t want dry frizz!) onto your scalp and brush it through your locks. And what do you have? Healthy, beautiful hair that no-one would guess hasn’t been washed that morning. Still, a word of caution – if your hair is naturally dry or normal, this probably won’t cut it for you. It takes its oil-absorbing job super seriously, so if your hair is already lacking oil, pass on this product. Also, as with many dry shampoos, if you have dark hair, you may want to be wary of this shampoo. This can leave a white powder residue in some people that can be noticeable against darker hair. 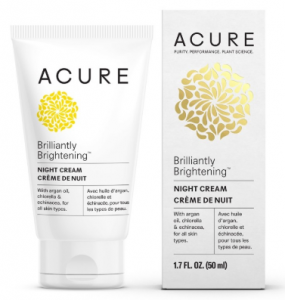 For dry skin, Acure Organics’ Brilliantly Brightening Night Cream can be a miracle worker. It will leave your skin smooth and hydrated. However, it’s not the best product for oily, and especially acne-prone skin, as it may add oil (and pimples) – although Acure does claim that it’s for all skin types. I personally don’t believe that any product suits all skin types, since every person’s skin is different. You can kind of tell that it’s targeted towards dry skin types, anyway, because it contains argan oil which is nature’s wonder for those of us with dry, chapped skin. Plus, there are so many night creams out there for oily and combination skin types. Acure’s night cream, with its natural and safe ingredients, makes for a pleasant change. It has a soft scent. It’s strong enough that you can tell it’s there, but not that strong that it becomes overpowering – the perfect balance. I have a bit of a mixed opinion about Acure’s Radically Rejuvenating Night Cream. On the one hand, it’s not really that great for under-eye circles or bags. So if you have bags big enough to hold a decent-sized watermelon under your eyes, and you’re hoping this will be the miracle cure for you – I’m sorry, but I don’t think this is your buy. However, this cream does brighten the area a lot, which makes your eyes stand out, and it’s super-hydrating. Even if you use a lot of product, it absorbs so easily into your skin and leaves it feeling so soft that it’s a pleasure to use. If you’re not struggling with under-eye bags, but just want brighter, healthier skin around your eyes, this cream is a great product. You can purchase Acure Organics’ products on their website, or at online retailers that stock their products. Just check out the ‘Store Locator’ tab on the bottom of their website and choose a retailer closest to you. Yes, of course they are cruelty free! Acure Organics cares just as much about not harming animals as they do about not harming us humans. While they are not a strictly vegan brand, they have loads of vegan-friendly products. You can check out the list here, updated as of 2017. Additionally, if you check out the Acure Organics website, you’ll notice that all their vegan products are clearly marked as such. In recent years, more and more people are starting to care about how the chemicals they subject their hair and skin to on a regular basis affect their health. Many are making the switch over to safer, organic products. With companies like Acure Organics, who strive to offer healthy alternatives for budget-friendly prices, this change has never been easier. While not every product will work for everyone; all in all, I’d say this company is definitely one to look into. It has something to offer no matter what skin or hair type you may have. I definitely give it a double thumbs up!